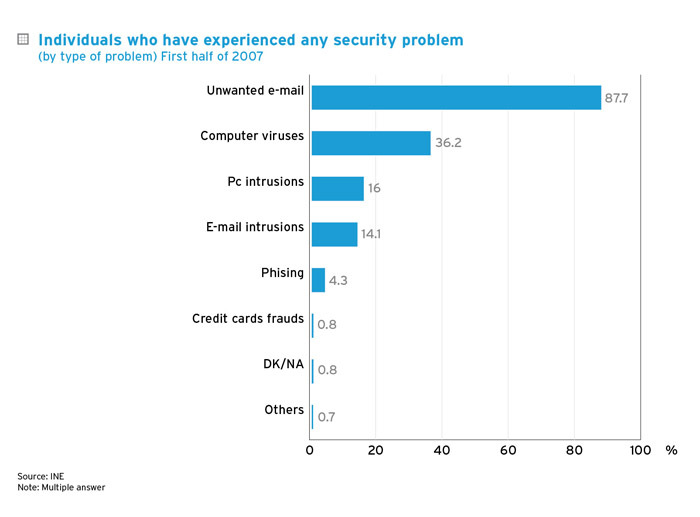 The IT security problems that affect the Internet population the most are, in first place unwanted and unrequested e-mail (the so called spam) and, in second place computer viruses that reduced their incidence by 36.2% in 2007. In the same way, credit card frauds have reduced their incidence and site at only 0.8% in the first half of 2007. Number of individuals, expressed as a percentage of the total population, who have experienced some type of security problem. Study based on telephone and personal interviews. The theoretical sample size is approximately 33,978 households. It refers to Spanish population aged 15 or over. It corresponds to an eEurope 2005 policy indicator.